Other than hand sewing, I was out of projects to work on, not fancying another UFO just yet. My husband reminded me that, while in Key West last year, I had bought a pattern and fabrics to make a couple of jackets. All were duly found, looked at, procrastinated about and nearly put away again. The trouble was, I have not made any garments for years and years, so was a little afraid. Much prodding on husbands part, they were cut out and sewn together. So here they are, I chose the Batik fabric for the blue one and hubby the brownish/green longer one which has little fish swimming all over it. They are just for putting on over a tee shirt. I had forgotten how good it was to sew garments. Might just have to look out some of my old patterns and update them.. I have had this idea in my head to make a simple block up, random pieced together and then used as a background for appliqué. So I found up some scrap fabric. "PINK" you might well ask! 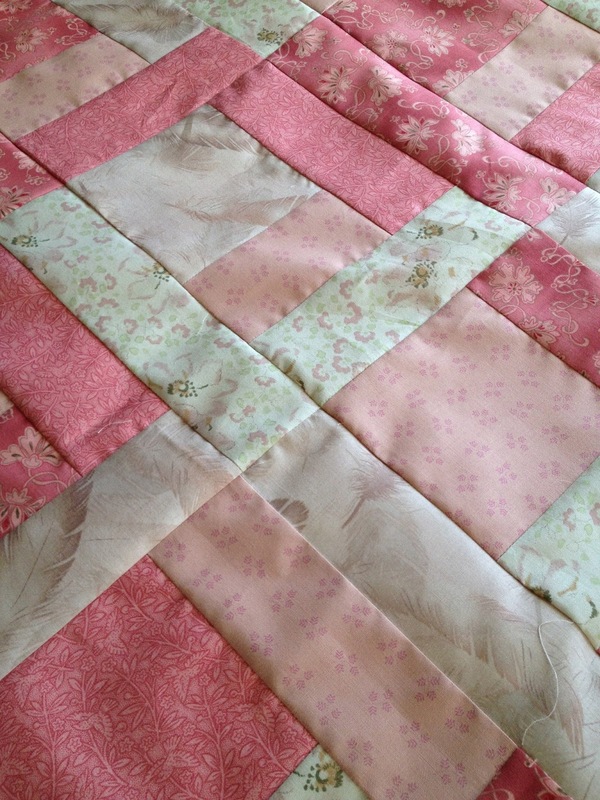 No, I don't do pink, well only in very small bits, and then played around with my very simple block. and randomly pieced them together. It was at this point I thought no "I definitely don't do PINK" and no, they are not suitable for what I had in mind. 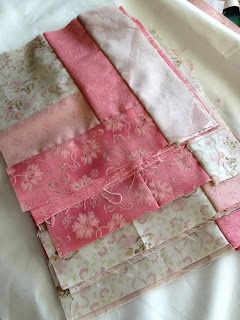 What the heck, I will baste it and practise my machine quilting and then gift it. It's about cot size so would make a nice baby quilt. On the day the BOM was put up on the blog there were 146 hits , so someone out there is following along with us. I do wish they would say hello, and perhaps link up with this blog to show us what they are sewing. I would love to see.